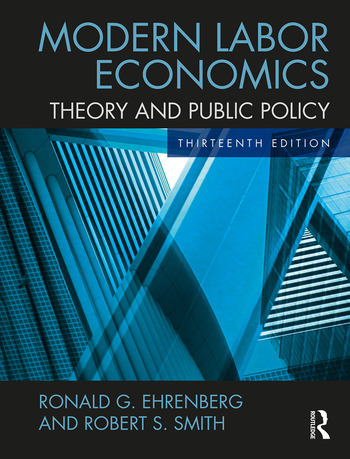 Modern Labor Economics: Theory and Public Policy, now in its thirteenth edition, continues to be the leading text for one-semester courses in labor economics at the undergraduate and graduate levels. It offers a thorough overview of the modern theory of labor market behavior, and reveals how this theory is used to analyze public policy. Designed for students who may not have extensive backgrounds in economics, the text balances theoretical coverage with examples of practical applications that allow students to see concepts in action. Experienced educators for nearly four decades, co-authors Ehrenberg and Smith believe that showing students the social implications of the concepts discussed in the course will enhance their motivation to learn. As such, this text presents numerous examples of policy decisions that have been affected by the ever-shifting labor market. tools for review and further study. In addition to providing updated data and examples throughout, the thirteenth edition offers greater coverage of inequality, healthcare policy, and labor-replacing technologies. The text is also supported by a full range of companion online materials. Ronald G. Ehrenberg is the Irving M. Ives Professor of Industrial and Labor Relations and Economics at Cornell University, USA. Robert S. Smith is Professor of Economics in the School of Industrial and Labor Relations and Stephen H. Weiss Presidential Fellow at Cornell University, USA.